Naju Korea) The sins in this world have increased in proportion as the world has developed a highly materialized civilization. Therefore, The Blessed Mother of Jesus Christ, Our Lord & Savior, has appealed for the salvation of mankind through Her apparitions all around the world including Fatima and Lourdes in the 19th & 20th centuries. The Blessed Mother appeared in Naju, Korea on June 30, 1985, Weeping Tears through Her statue which is owned by Julia Kim and has been present ever since. 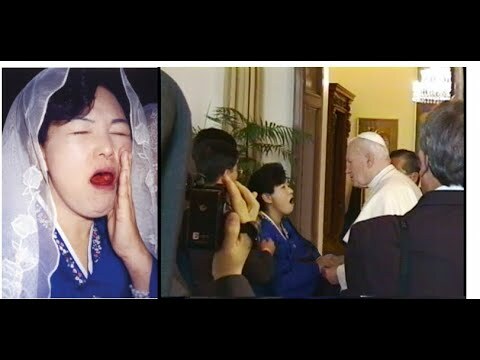 Julia Kim, who was chosen by The Blessed Mother for the conversion of mankind has been living a life of martyrdom through her shared redemptive sufferings of Jesus Christ and has been offering up her daily life for the salvation of humankind for over 30 years. Thousands of Clergy and Religious as well as numerous children from all over the world have visited this place. Since visiting, they have been living lives of resurrection through the grace of repentance. Not only have they received graces of spiritual and physical healing’s in The Blessed Mother’s everlasting love, but have also kept visiting continually, even until now. The unprecedented Miracles and Signs, from Our Lord Jesus Christ & The Blessed Mother of Naju are as follows: the Blessed Mother’s Tears, Tears of Blood, Fragrant Oil, Mother’s Milk, Eucharistic Miracles, Miracles of The Precious Blood of Jesus Christ and the Water of Graces (Miraculous Water). All of these which have been considered to be one of a kind in human history show the infinite love of Our Lord Jesus Christ and The Blessed Mother. The Messages of Love given through Julia Kim in Naju have been spreading throughout the whole world, beyond national boundaries and races. The Amazing Miracles of Love that numerous people have received, and having been healed, and sanctified, are spreading throughout the world continuously. The Sodality of Mary’s Ark of Salvation will be holding “The 30th Anniversary Celebration of Our Lady’s Weeping Tears in Naju, Korea” on August 29, 2015 to commemorate the Love given to us by Our Lord Jesus Christ and The Blessed Mother for over 30 years. Thousands of pilgrims including clergy and religious from dozens of countries world wide will be participating in the celebration by organizing pilgrimage groups. Volunteers pay full attention to the preparation of the Celebration so that pilgrims to Naju may have a grace-filled experience here. Naju is a place where one can find the combined Love of Jesus Christ and The Blessed Mother! A place where Our Lord Jesus Christ and The Blessed Mother are present and perform Miracles! Eucharistic Miracles, Descent of The Precious Blood of Jesus, Miraculous Water and numerous signs through Julia! We invite all peoples of the world to join us in “The 30th Anniversary Celebration of Our Lady’s Weeping Tears in Naju, Korea” to share in the Graces and Love of Our Lord Jesus Christ and The Blessed Mother together. Our Lady invites you to celebrate the 30th Anniversary of Her weeping Tears in Naju, Korea on August 29th, 2015 !